The solar hotshots of 2013! During 2013, long stretches of solar inactivity alternated with brief spurts of high flaring activity levels. The periods of solar calm featured numerous filament and prominence eruptions, with so many spectacular events they could easily fill this review. 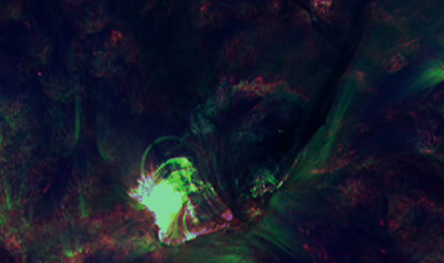 There were 12 X-class solar flares, almost as many as 2011 and 2012 combined. Yet, only 5 sunspot regions were responsible for these extreme explosions on the Sun, and most of them took place during the latter part of 2013. 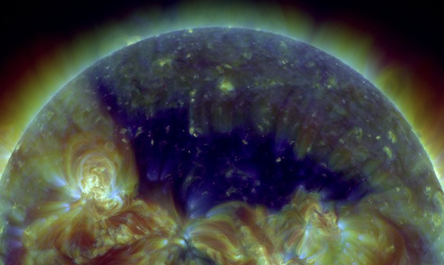 Underneath a selection of the most impressive solar events that spiced up the past year. Using Helioviewer and JHelioviewer, a MOVIE was created containing one or more clips of each event. 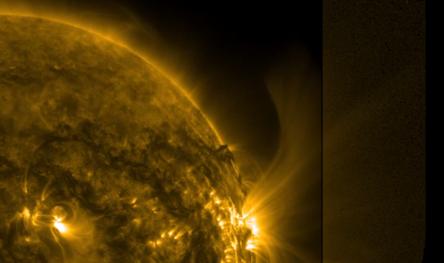 Usually, SDO-images were used, occasionally supplemented with imagery from STEREO, PROBA2, SOHO, GOES/SXI, and the GONG H-alpha Network. Well aware this selection gives only a glimpse on what 2013 had to offer, we do hope this review provides a good idea of the evolving activity of ongoing solar cycle 24. More details on the discussed highlights can be found in the archive of news items on the STCE website. Happy reading, and the best wishes for a spectacular New Year! A C8-flare in the relatively small and simple active region NOAA 1667 was accompanied by the ejection of the group's filament. This material was dark and dense, indicating low temperatures of "only" about 10.000 degrees. 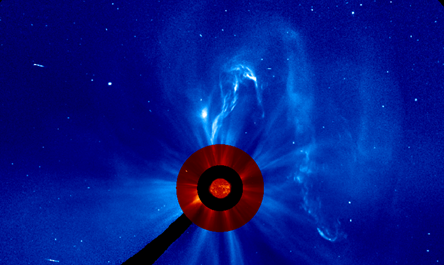 Due to the helical ("corkscrew") movement of the material, the ejected filament got the shape of Batman's cape before it finally departed from the solar surface as a tenuous, non Earth directed coronal mass ejection (CME). 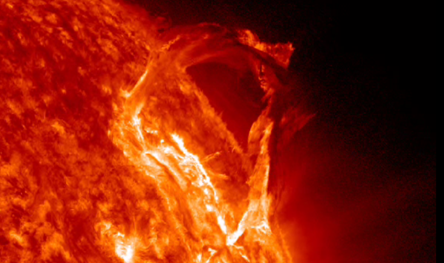 The first few months of 2013 featured several filament and prominence eruptions, and on the average about half a dozen CMEs every day. Quite a few CMEs were truly spectacular, but most were not directed to Earth or occurred on the Sun's backside. On 16 March, a filament to the west of spotless region NOAA 1690 erupted in a spectacular fashion. The associated CME was weak and not directed to Earth. The first spurt of high flaring activity occurred near mid-May, when in a time-span of only 48 hours NOAA 1748 managed to produce 4 X-class solar flares. This sunspot region was relatively small 4-5 times smaller than the aforementioned NOAA 1654), but was magnetically very complex. 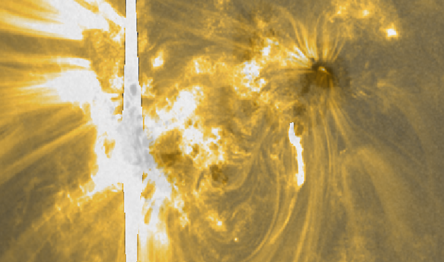 The first X-flare occurred when NOAA 1748 was still behind the east limb, and the 2 subsequent X-class events were actually white light flares (WLF) as seen by SDO's telescopes in visible light. During the last flare early on 15 May, NOAA 1748 had already rotated far enough onto the solar disk such that the associated CME became geo-effective on 18 May, sparking a minor geomagnetic storm. After some magnetic interaction with NOAA 1748, a long duration event (LDE) took place in NOAA 1745 on 22 May. The M5 flare was associated with a solid CME of which a glancing blow initiated a minor geomagnetic storm on 24-25 May. More importantly, it was the source of the strongest proton flare in 2013. 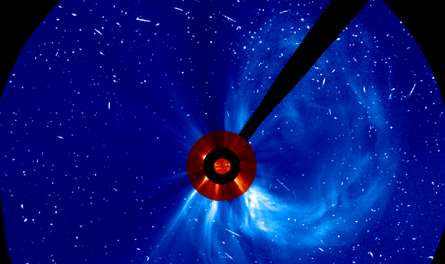 These protons can be seen as numerous white dots and stripes on the imagery from SOHO's coronagraphs. The event was 4 times less intense than the strongest proton event so far this solar cycle (March 2012). A huge coronal hole (CH) is transiting the solar disk. This CH had an area equivalent to more than 300 times the surface area of the Earth. It managed to survive 8 solar rotations, with the first central meridian passage around 23 May, and the last one on 30 November (8 transits). It sparked geomagnetically active to minor storm conditions during the first 5 transits. 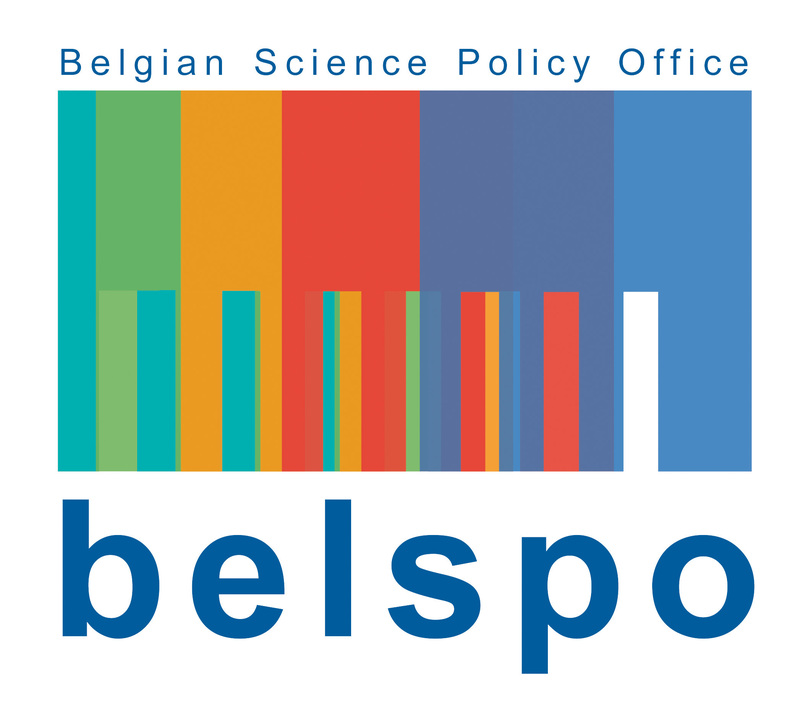 The high-speed (700 km/s) stream also brought a whole bunch of high-energy electrons with it, and satellite operators noted a significant increase in anomalies during these periods, thought to be due to repeated electrostatic discharges. Fortunately, none of the spacecraft was permanently damaged. During its October and November transits, the CH had become too small to have a significant space weather impact. Event 7: 10 September 2013 - Almost a spotless day! As small sunspot group NOAA 1838 was falling apart, another active region NOAA 1839 appeared just in time to avoid a spotless day, which would have been the first since 14 August 2011! A spotless day during a solar cycle maximum is not uncommon, but it remains of course a rare event. This absolute low in sunspot number highlighted a period of very low solar activity, with hardly any flares (no C-flares from 7 till 17 September: 11 consecutive days) and no (minor) geomagnetic storms for a full month! Meanwhile, the magnetic field near the solar north pole (finally) completed its reversal, whereas this magnetic flip is still ongoing at the south pole. These reversals testify we're close to the maximum of solar cycle 24. 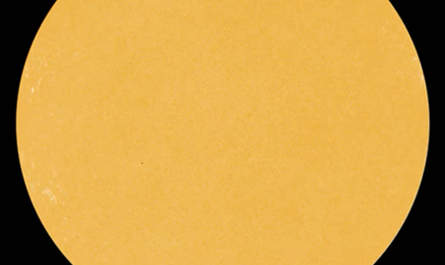 Late on 29 September, a long and solid filament in the Sun's northwest quadrant erupted in a spectacular way. 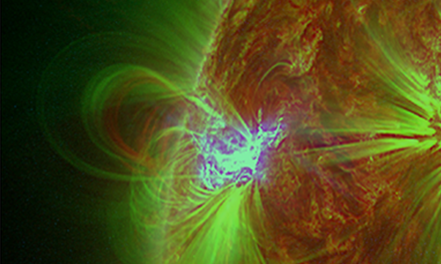 The modest C1-flare (a so-called "Hyder flare") lasted for more than 3 hours, and was also a moderate proton event. This LDE was accompanied by a CME shaped like a whip, making some observers recall Balrog's whip in a famous battle story about a ring. But that's probably coincidence... In the end, the CME delivered a glancing blow to the Earth on 2 October, resulting in a strong geomagnetic storm (locally even severe levels). Together with the storms of 17 March and 1 June, it belonged to the strongest geomagnetic disturbances of 2013. Event 9: 22-29 October 2013 - Triumvirate wreaks havoc! 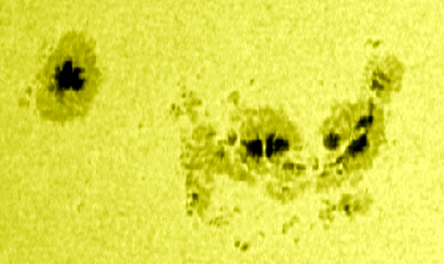 A trio of complex sunspot groups significantly beefed up the flaring activity during the last week of October. From 22 till 29 October, no less than 26 M- and 4 X-class flares took place over the solar surface, making it one of the most flare intense periods so far this solar cycle. Responsible active regions NOAA 1875, 1877 and 1882 also destroyed a million km long solar filament in the process, and NOAA 1875 would stay very active during its subsequent backside transit of the Sun, as nicely recorded by the two STEREO-spacecraft. On 5 November, NOAA 1890 produced an X3.3 flare, the strongest of the year and the number 3 -so far- in solar cycle 24. NOAA 1890 was a big sunspot group with a magnetically complex trailing part, and would produce another 2 X-class solar flares during its passage over the solar disk. 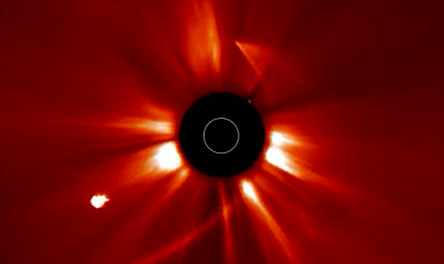 All three were impulsive flares lasting 10 minutes or less, but they were each associated to a non-Earth directed CME. 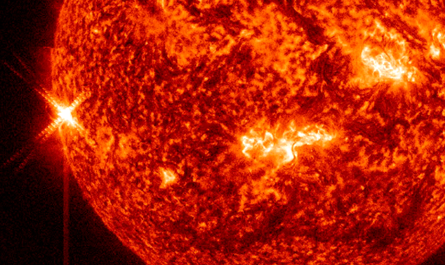 In total, there were 12 X-class flares in 2013, bringing the total for SC24 on 27. Throughout the year, some impressive structures in the solar corona were visible. These delicate, wavy, several 100.000 km tall curtains exist as the hot solar plasma traces the fine magnetic field lines. Usually at some point, magnetic reconnection occurs leading to a simplification or disappearance of the structure. On some occasions though, they can continue to exist for many weeks, as was the case late 2013.